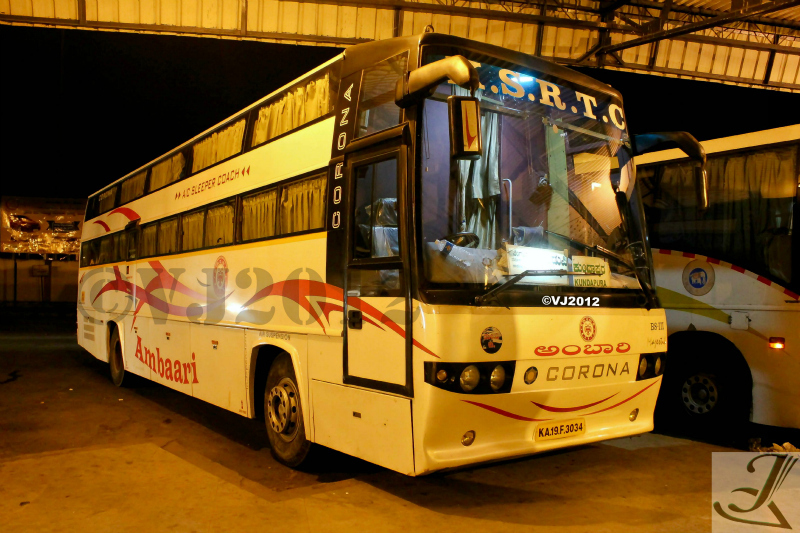 Service- KSRTC Ambaari (Corona A/C) Sleeper. I decided to try my chances this time by boarding the bus at Navrang as I was still not sure of which operator I would be undertaking the journey with. My friend dropped me at Navrang and the moment I arrived there, I realized I had committed a big mistake. There were scores of people waiting for buses heading to different destinations and the busy road was jammed with buses from different operators. Myself and my friend decided to split up and hunt for tickets. My first stop was Durgamba Travels, sadly not tickets (as expected), next stop VRL travels, though seats were available the bus had already crossed Yeswanthpur(tough luck). My friend called up and said all Mangalore bound operators had their buses running full. A sense of despair slowly started to sink in. I slowly started walking back when I saw a string of KSRTC buses heading down the road. The first was a Dharmasthala bound Rajahamsa, followed by a Mangalore bound Rajahamsa and right behind was an Ambaari Sleeper (Corona A/C) heading towards Kundapur..!!! The bus was moving at a slow pace in the middle of the road. I immediately shouted out at the conductor if there was a seat available to Kundapur and the conductor replied 644Rs… The bus stopped right in the middle of the busy main road and picked me up. I boarded the bus and asked the conductor by any chance if there was a single sleeper berth available, the conductor said yes… (Score) Asked him what were the berth numbers… Conductor replies 16 and 32… Did a quick thinking and replied back telling him that I would take Berth no 16. My conductor puts a smile on his face now and says both the berths 16 and 32 are located one above the other, at the ‘LAST ROW’. I stood there helplessly..!!! The bus was being driven exceptionally well and in no time we covered the elevated toll way and took a left turn towards the Bangalore-Mangalore highway. My bus was overtaking every vehicle which came in its path and when I checked the speed on my GPS speed tracker, it showed the bus doing speeds close to 90kmph. Tried to sleep for sometime however the rock solid pillow was giving a tough time. We reached Channarayapattana at exactly 11:45pm. We had covered around 146kms(appox) in 2hrs 15mins. We stopped for a break at the bus stand. We were the first bus which came into the bus stand at this point to time from Bangalore. I decided to go clicking and just when I was about to take the picture of my bus, a Volvo bound to Mangalore came in and parked right next to our bus. 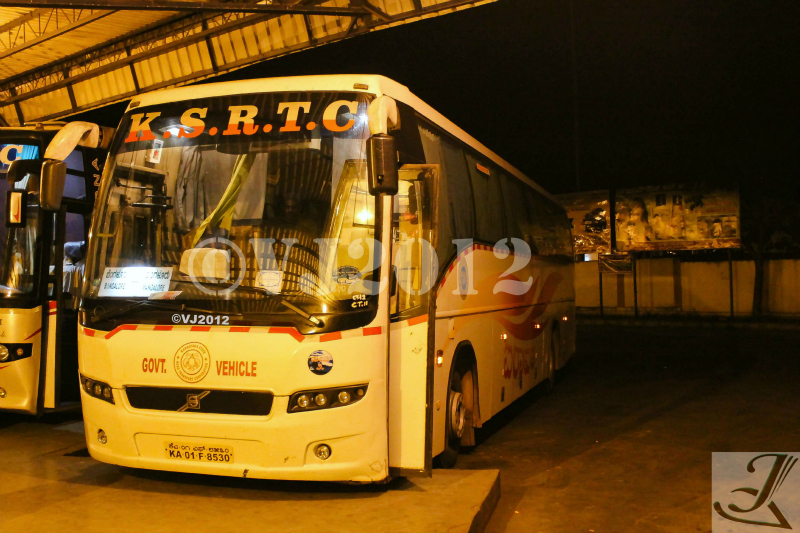 A couple of minutes passed by and another Airavat joined us and this time it was a Kundapur bound Volvo. Needless to say that I would have been delighted if I had got the Volvo in Bangalore, however all the seats in this bus was full. We departed from Channarayapattana at 00:05am after a good 20mins break and headed towards Hassan. A couple of minutes later, I saw the speeding Kundapur Volvo trailing our bus, and within no time it overtook us. I finally decided to get some shut eyes but I was finding it very difficult to sleep as every time the bus went on a rough patch or when it swayed from left to right and back(while overtaking) I was either sliding off from my pillow or slamming my head towards my pillow. Finally I was able to get some sleep. A couple of hours went by and all of a sudden I was thrown up and came down crashing on my bed. No guesses as to where the bus was traveling, we had entered the Shiradi Ghat. The roads showed no mercy on the bus and the bus in-turn showed no mercy to me. We slowly crossed the Shiradi ghat and I continued my sleep. After crossing the Shiradi ghat, I was able to sleep peacefully without any further disturbance. However, I could feel the bus hitting rough patches here and there, but I was too tired to get out from my sleep. Finally at 5:15am, the lights inside the bus were switched on and the conductor shouted out Manipal. I woke up and started guessing how the bus reached Manipal before Udupi. It is then when I realized the bus came via Karkala and not via Mangalore. We reached Udupi by 5:30am and slowly made our way towards Kundapur. I was dropped off at Shastri circle at exactly 6:15am. Overall the journey with respect to time management was very good. We did not make any unscheduled stops and since the bus was full, we did not stop at Hassan or at Sakleshpur bus stand.. I was expecting the bus to reach Kundapur by 7am however; the bus was driven very well to maintain time. Will I take this service again? Absolutely yes, however not the last row berths. 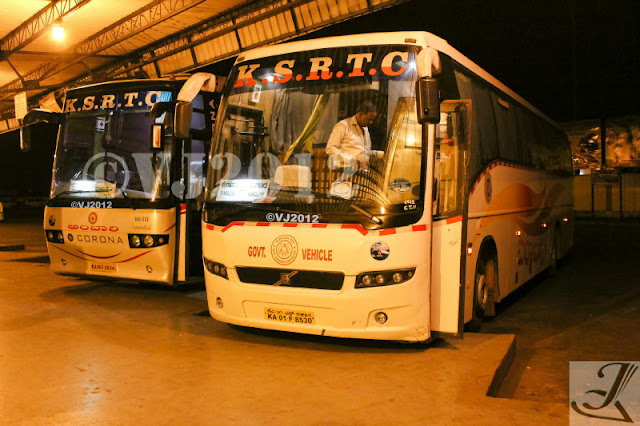 The journey was back breaking but given the situation I was in, I am happy to say KSRTC saved my day.